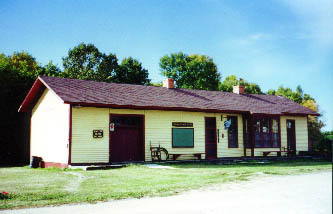 The Minneapolis and Pacific Railroad, later renamed the Soo Line, was laid through Annandale in 1886 and a depot was built. The depot has a waiting room for men and another smoke-free and spit-free for ladies. 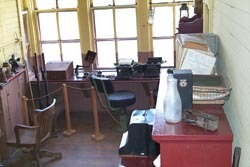 The stationmaster's room separates the two so the ticket agent could sell tickets through windows in both rooms. The telegraph in the stationmaster's room recalls the time when long distance communication was only by letter or code which was transmitted over wires strung on poles next to the train tracks. The constant clicking of the telegraph key was a part of the atmosphere of the early depot. The two large levers to the left of the stationmaster's chair were connected with uprights high above the depot. The projecting arms signaled messages to the engineer and conductor of passing trains. The fork like device held up a mailbag which was grabbed "on the fly" without the train stopping. depot would be filled with chirping until farmers came to pick up their day-old chicks. All the mail came and went from the depot, as did important telegrams. In 1972, the Soo line discontinued service to Annandale. Because he depot had been such a vital part of Annandale's community life, efforts were made to preserve it. Those efforts became Pioneer Park when the depot was moved to its present location. Note: The Poke Bonnet Gift Shop is located in the former baggage room of the depot. The gift shop is open during our summer hours and especially during school tours. 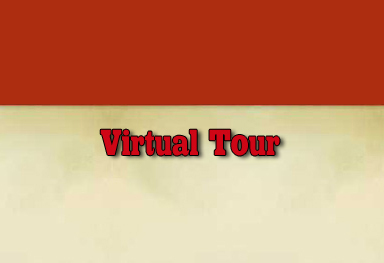 Come in and browse around, you will find crafts, souvenirs, old fashioned stick candy for all ages, children’s toys and books for the history buff. You will be pleasantly pleased with our prices.